Up, up and away... if you have a hankering to be up with the birds in the clear blue sky, the Gold Coast is one of the best places in the world to do it. The view is amazing - with the deep blue Pacific Ocean in the east, the canals and highrises of the Gold Coast on land, stretching to the beautiful mountain scenery of the Gold Coast hinterland in the west and beyond, you'll never be short of things to check out. There are a number of helicopter charter companies and scenic flight providers on the Gold Coast and most of them operate from Mariner's Cove at the Spit. You can also get on board a scenic flight from the Gold Coast airport and other airstrips around the Coast. We've included some operators for you to check out below! A clean clear morning, the sun peaking over the horizon, you're about to gently drift up and over some of the most picturesque scenery that Australia has to offer. Hot air ballooning on the Gold Coast is a superb way to see the diverse lanscapes of the region from the high-rises along the coast to the high peaks in the Hinterland. Queensland is the country's most popular place to hot air balloon and the Gold Coast offers a wealth of amazing views to take in. 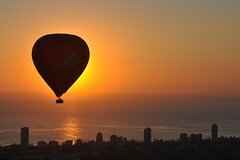 Experience the wonder and romance of ballooning over such picturesque scenery.There are a variety of hot air balloon companies and providers on the Gold Coast to choose from who take off from various locations on the Gold Coast. Some balloon flights can be bundled with other activities or breakfast to make for a complete experience. Inflation locations are carefully chosen to ensure optimum take-offs for maximum enjoyment. Take a closer look at the variety of hot air ballooning packages we have available. Hot Air operates the best value hot air ballooning rides in Australia, perfect for your first time if you have never ballooned before! The Gold Coast offers a wealth of amazing views to take in. Experience the wonder and romance of ballooning over such picturesque scenery. Inflation locations are carefully chosen to ensure optimum take-offs for maximum enjoyment. Choose between a 30 minute or 60 minute ride including breakfast! Go on a scenic adventure in Byron Bay with a hot air balloon ride. Get spectacular views of the region on a one hour journey - make sure to have your camera ready as there'll be plenty of incredible photo opportunities of the Coastline and more. Watch as the balloon inflates and enjoy the amazing feeling of rising to the height of the clouds and let the wind carry you around this beautiful region. Includes a gourmet champagne breakfast. 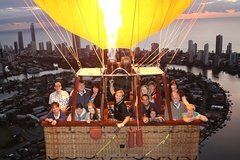 Get incredibly scenic views of the Gold Coast from both the water and air with a combined package for a Hot Air Ballooning tour and sightseeing cruise all for a single low price! Your adventure will begin with early morning hot air balloon flight over the beautiful hinterland, followed by a delicious champagne breakfast. Next you can choose between either a morning or afternoon sightseeing cruise with complimentary snack. Take to the skies for a thrilling and scenic plane ride over the Gold Coast. Sitting in the back of a tigermoth racing above the shoreline of the Gold Coast's iconic beaches is a whole other experience! A scenic plane flight offers you a truly unique way to experience the spectacular and diverse Gold Coast landscape! If you're looking for a thrill why not try a ride in a tigermoth bi-plane? If you're looking for less thrill and more "chill" you might what to try a scenic flight in a seaplane. There are a variety of packages which offer some unique ways to see and experience the Gold Coast. Check out the below operators and book online. See the Gold Coast from a unique view on an adventure or acrobatic flight in a Russian YAK 52 Warbird aircraft, with stunning views over the beaches and hinterland. The acrobatic flight is perfect for thrill seekers - your pilot will perform rolls, twists, loops and extreme manoeuvres over the Gold Coast. Choose between the 10 minute or 25 minute flight. Departing from Coolangatta, this experience is one you'll never forget! Ready to see the Gold Coast in all it's glory? Soar over the Gold Coast, it's iconic beach, the hinterland on a helicopter tour. There's a little something for everyone: short 5 minute jaunts, a 30 minute Tweed to Stradbroke joy ride or double your pleasure with a jet boat and helicopter thrill package. Most helicopter flights leave from three Gold Coast locations: Mirage Heliport, Sea World, and Coolangatta (Gold Coast Airport), however there are combo-passes available which may include a hotel pick up. Take some time to browse through the selection of Gold Coast helicopter tours below to find a package to suit your requirements and budget. 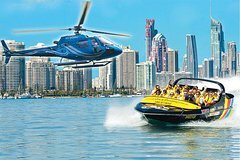 See the Gold Coast from an unforgettable vantage point with a helicopter flight from Sea World. Choose from a range of available helicopter flight lengths and options, ranging from a short 5 minute flight over the Broadwater all the way up to an epic 30 minute flight down to the Tweed Coast. Bring your camera as you'll get some outstanding photographs of the Gold Coast's iconic beaches, shining city skyline or lush green hinterland. Enjoy a thrilling 55 minute jet boat ride along the waters of the Gold Coast as it spins, slides and speeds past some of the best sights in the region. The whole family will love the squeal-worthy adventure of jet boat riding. The second part of the package takes you above the sights you just zipped past on a 5 minute helicopter ride, departing from Sea World and taking you towards South Stradbroke Island.